For most of the last year, the folks who live in my neighbourhood, myself included, had passed by this pink storefront and wondered if the business was ever going to open. Then this past weekend I noticed that it had, so of course I had to take a look. 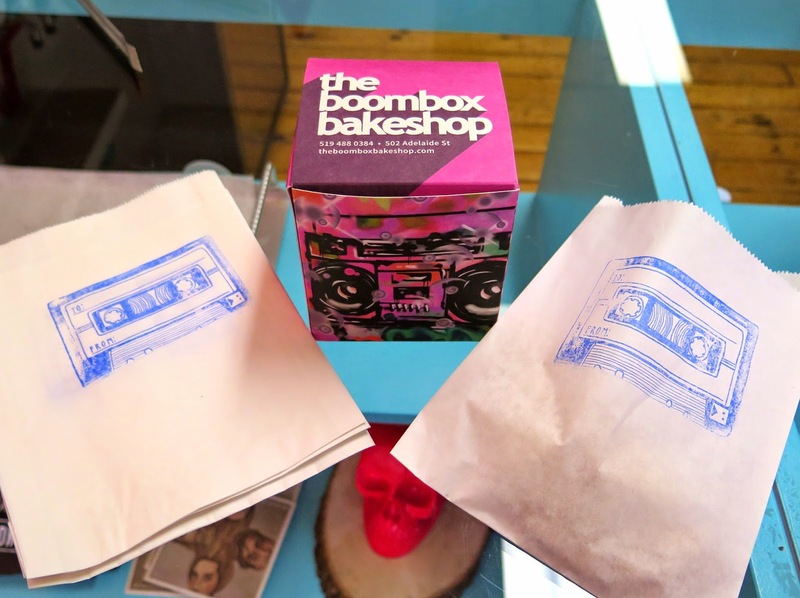 the boombox bakeshop is a cute little bakery/cafe whose interior reflects the owner's passion for music. 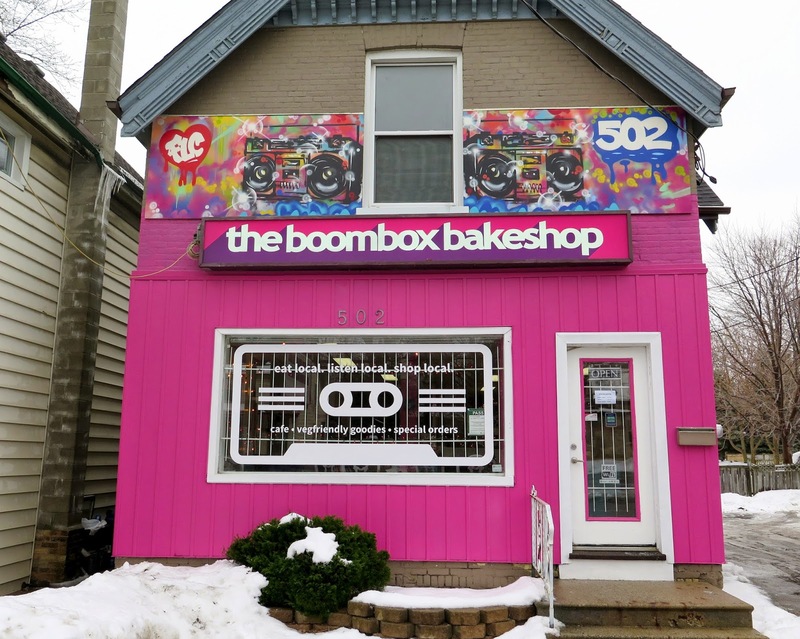 After years of working in retail, Alexandra Connon decided to combine her love of baking and music into her own business, which has been open for about a month. The sign outside pretty much sums up the philosophy behind the business. Connon had live music in the shop on the Friday night, and plans to host regular music events. The art displayed in the shop is created by local artists. 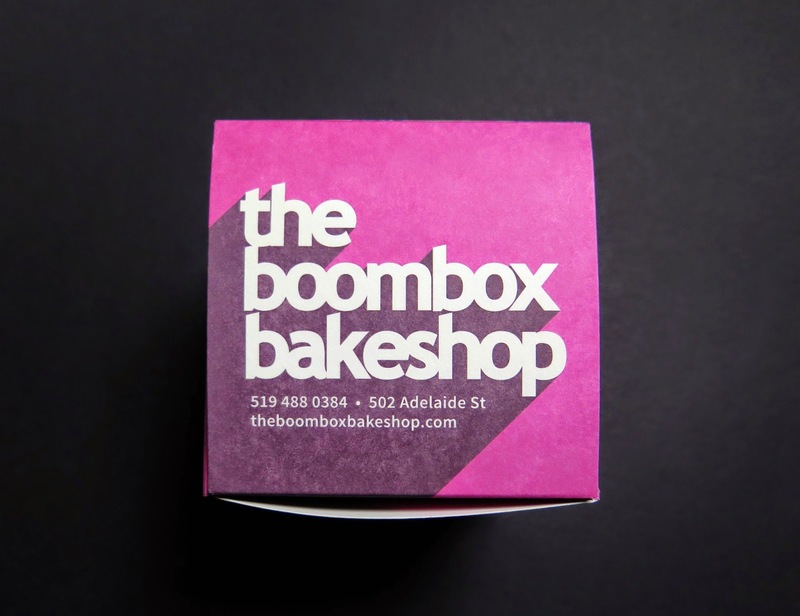 The funky music-themed packaging was designed by a local company, Georgette Packaging, the owner of which used to own a cupcake bakery in Northern Ireland. 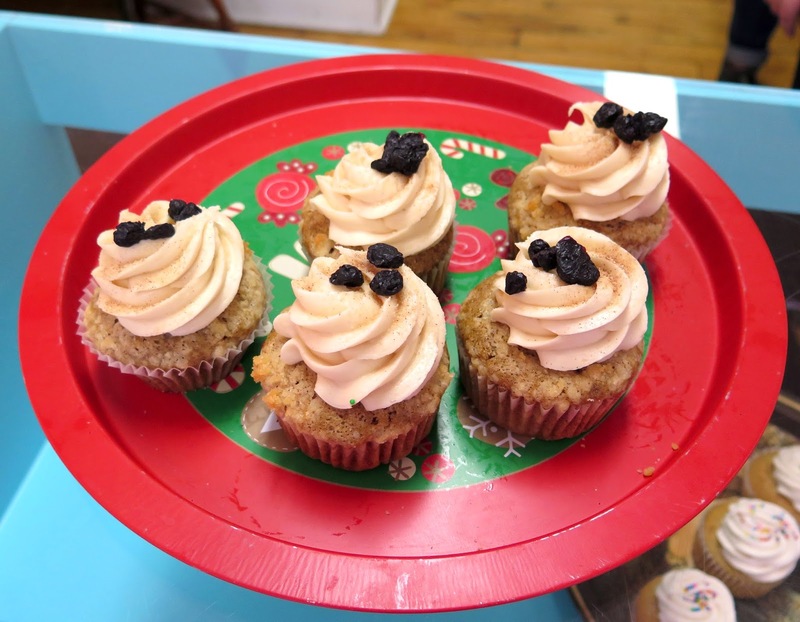 The "Wake Me Up Before You Go Go" cupcake, featuring a french toast-flavoured cake with a streusel and maple icing. Chocolate fan that I am, I selected a "C is For Cookie" with a chocolate cake base with cookies and cream icing. To be perfectly honest, I'm not a big fan of cupcakes, or cake in general. I don't mind the cake part, if it is freshly baked, but most are covered in too much sickeningly sweet icing. 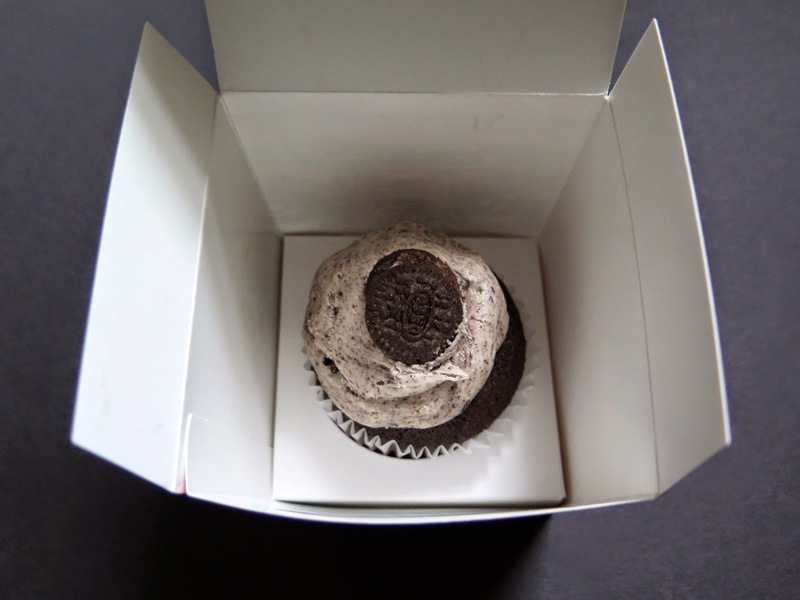 I am happy to report that this cupcake was very moist, with a pleasant, slightly crispy texture on the top of the cake part, and while there was still more icing than I needed, it was very tasty, and not cloyingly sweet. If I was craving a sweet dessert, I would go for another one of these, although maybe the double chocolate next time. I also tried one of the sweet potato and kale popovers, which I warmed up in the toaster oven at home, and it was delicious. 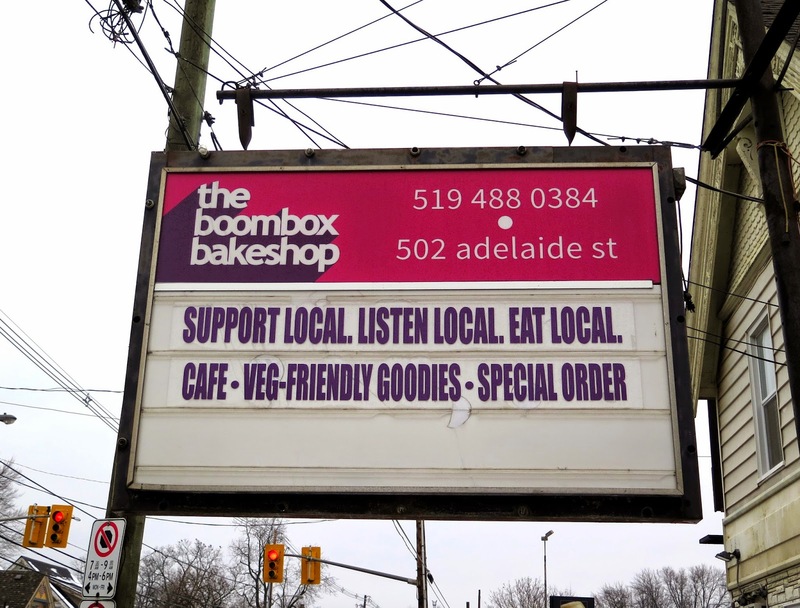 the boombox bakeshop is a very welcome addition to the Old East Village neighbourhood, providing an attractive setting for a coffee and a treat, and an alternative venue for musicians and artists to find an audience for their work. 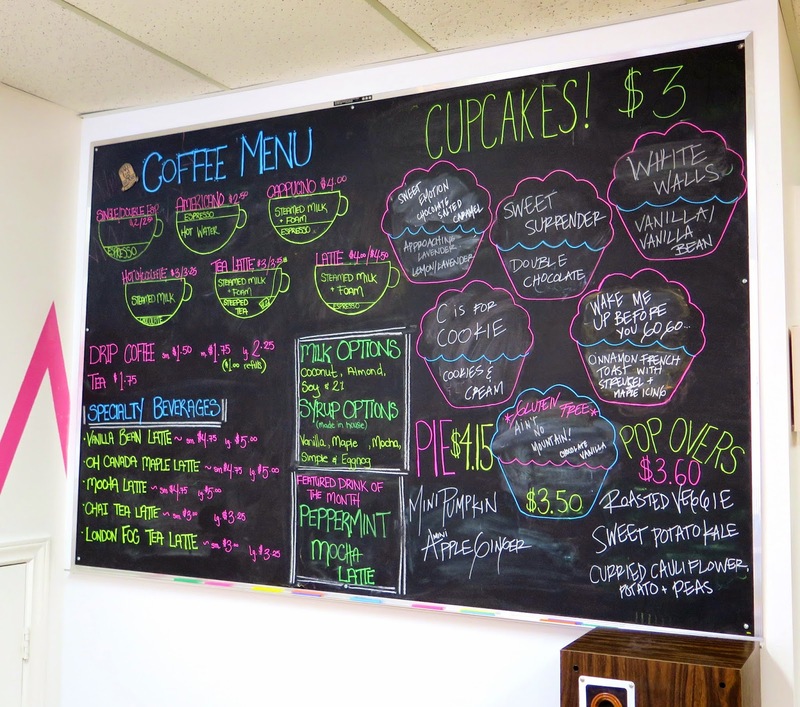 The bakeshop is open Tuesday - Friday 9 am - 5 pm, and Saturdays 10 am - 4 pm. You can also find more information on their website. Cool place! 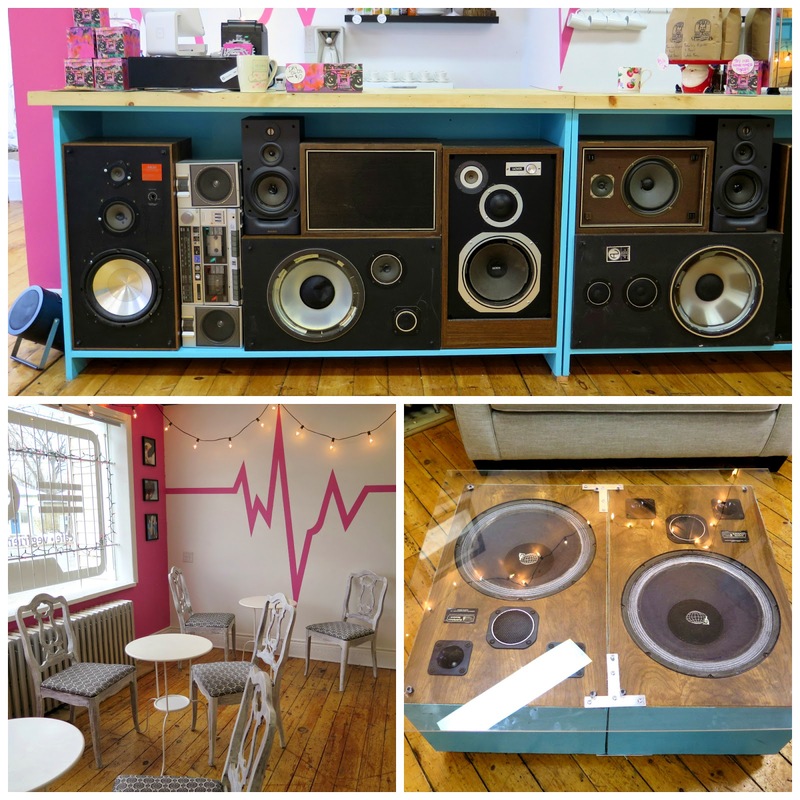 It looks like a fun place to hang out with friends for music and snacks. How wonderful to have this colorful addition to your neighborhood. Music and delicious treats make a great combo! Another fabulous review! 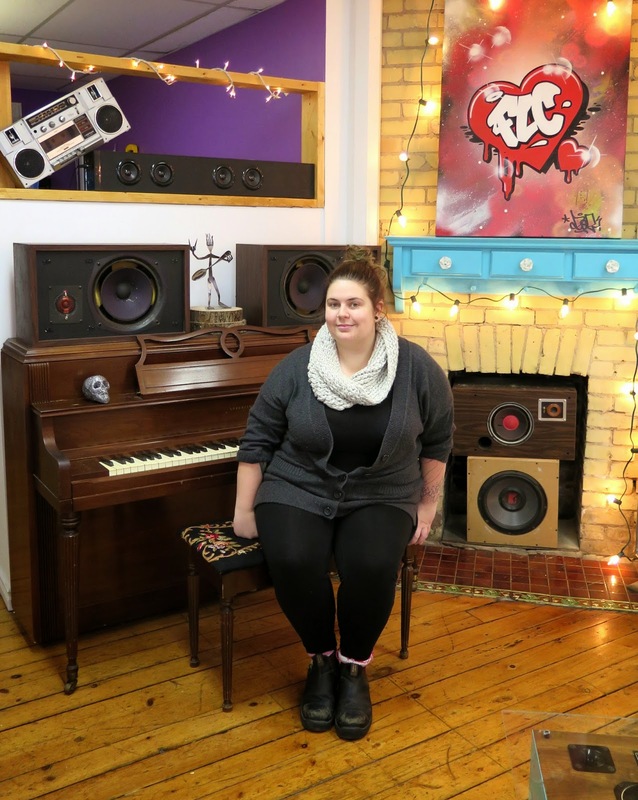 This gal has a fresh approach to music and cupcakes, I think it's so darn cute! I think I could happily spend some time here and consume some yummies! it looks a cute and fabulous shop, with a lovely decoration and music!, such a fabulous packaging! besos & supporting local business! Great post. Free cupcakes for you for a year! What a lovely new shop in your neighbourhood. The temptation to eat sweets will be almighty but you can always say you're going for a potato kale pop-over as an excuse. And it's good to know there's a place for music not far away from home, especially in winter. I guess it's a win/win. I'm all for supporting local. Perfection! Cute clever and quirky ! Wishing them loads of success. Love this!!! I love how you are supporting local music also! Great packaging, great decor! Congrats!!! That's a cool and unexpected mix of music and sweets. I love the packaging! What a cool place! Makes me wanna take a looooong trip to get a cupcake! You are so good with writing reviews, I feel so pleasantly informed. Now if you could only get paid for all you do, or some kickback like free coffee & cake, or clothes, or artwork, depending on the place. Maybe put together a book of places to go...I don't know, I must be looking for a job. Next week i'm going for skills tests at the McGill Universitie's hospitals, that would be great to work in health care - Wish me luck!